Here are some final notes on our championship. 1. PITCHING- The starting pitchers who accounted for the six victories (Dylan Robertson, Rob Simsiman, Tyler Delatorre, Jaylon King, Lane O'Dea and Jordan Pearce) held the opposition to 24 hits in 125 AB's, or an average of .192. Of the 24 hits allowed, 22 were singles, and neither of the two doubles given up were allowed to score. The six pitchers allowed 18 total runs (12 earned) for a team ERA of 2.92. They struck out 35 and walked 17 (3 of these walks were immediately picked off 1st by Lane!). In addition, Thomas Zlatic and Tristan Sizik got valuable pitching experience. We didn't win their game, but both pitchers battled hard. 2. BATTING- The opposition pitching could not duplicate against our batters. We got 68 hits in 145 AB's, or an average of .469. Our on base percentage was .602. Of the 68 hits we got, 17 were extra base hits, including 11 doubles and 6 triples. Eight of the ten Swarm got at least one extra base hit. After reaching base in his first 18 plate appearances, Rob was finally retired but led the team with an .833 average, followed by Lane at .727 and Jordan at .563. As a team, we stole 65 bases in 70 attempts, including a combined 11 for 11 for Yassin Wahhab and Matt Myron. As we move on to get ready for our next tournament over Labor Day weekend in Fallbrook, it was worth one last look back at a great performance by all 10 Swarm players. The entire Swarm team and their families took the gondola ride up the mountain tonight to receive their 2006 9U National Championship trophies. Each player received a plaque and a t-shirt proclaiming them National Champions. The team received a banner, team trophy, a TPX bat and glove, and a laminated copy of their bracket. The night was terrific, and everyone was basking in the glow of a great week. Tomorrow morning at 6AM, the team begins it's trip home, and everyone should be safe in their own beds tomorrow night (not a small thing!). Next up for the Swarm is the Southern California Championships in Fallbrook on Labor Day weekend. Until then, some much deserved rest. A huge debt of gratitude is owed to Roger Simsiman for getting all of our gear ready (the new uniforms and jackets are so great), all the travel arrangements and for his masterful webmaster work and dugout management. To Justin and Rafael, great coaching with you both. This was a trip to remember for a lifetime. See everyone at home. Day 8 - WE ARE THE CHAMPIONS! The San Diego Swarm registered their fourth straight run rule victory, an 8-0 shutout over the Tuff County Predators to win the D-2 National Championship for 9 and under. Jordan Pearce continued the string of brilliant pitching performances, throwing a 2 hit, 8K, 1 walk gem. Offensively, Lane O'Dea, Thomas Zlatic, Rob Simsiman and Jaylon King ripped extra base hits, and Jordan topped off his day by lining a walk off single scoring Thomas to secure the win. All four infielders (Rob at third, Dylan Robertson at short, Yassin Wahhab at second and Jaylon King at first made plays behind Jordan, and Lane caught a great game. We are off to the awards ceremony tonight, and return home tomorrow. Thank you for the love from home...it meant alot!! GO SWARM!! The San Diego Swarm posted their third straight 10 run rule victory tonight at Vanatta Field, a 12-2 victory over the Bear Creek Bears that put the Swarm in the D-2 championship game tomorrow at 1 PM. Lane O'Dea became the fifth Swarm starter to post a complete game victory. He allowed only two runs and three hits, with three K's. His six walks were negated by picking off three of the six. The offense was at it again. Thomas Zlatic led the way this time with a 3 for 3 day with 3 RBI. Rob Simsiman, Jordan Pearce and Jaylon King had two hits each. Extra base hits were racked up by Rob, Dylan Robertson (2 RBI Double) and Jaylon whose walk-off double in the fourth clinched the victory. Yassin Wahhab and Tristan Sizik added hits to the Swarm attack. The team stole 17 bases in 17 attempts in just 3 1/3 innings. Rob has an incredible streak still intact, reaching base safely in all 18 plate appearances in Colorado. He has 9 base hits and 9 walks in the six games played. All ten Swarm players have been terrific, both in attitude and performance. Every player on the team has contributed to the success of the team this week. The coaching staff and all the parents are so proud of our team. One more game left to bring home the championship. Jordan Pearce will take the mound for the Swarm. Wish us well!!! The San Diego Swarm completed a 10-run rule sweep tonight with a 14-4 victory over the Parker Colorado Bandits. The victory sends the Swarm into the D-2 Semi-Final game tomorrow night at 6 PM. The offense blew apart a 3-2 deficit with an 11 run 3rd inning in which the Swarm got 9 hits and drew 2 walks. Overall, every Swarm batter scored a run, got a hit or drove in a run. Lane O'Dea led the way with a 3-3 day including a triple, while Rob Simsiman, Jordan Pearce and Tyler Delatorre each had 2 hits. In addition to Lane's triple, Rob, Tyler and Tristan Sizik hit doubles to pace the extra base hit attack. The game ended with Matt Myron ripping a base hit to right to score Dylan Robertson, who had led off the fourth with a hard single to right and stole second. Tyler caught his third complete game of the tournament. The fourth pitching gem of the tournament was turned in by Jaylon King. Jaylon earned a complete game victory by striking out a tourament high 9 batters while walking only 1. He scattered 6 hits to earn his first Swarm win. The Swarm pitching has been incredible! Dylan, Rob, Tyler and Jaylon have combined for 24 K's and only 10 walks in earning a 4-0 record. All this with Lane and Jordan Pearce poised to pitch the final two games. All of the families are loving the guestbook postings (feeling the love!) FROM BACK HOME AND ALL OVER THE COUNTRY!!! We play our next game tomorrow night at 6 PM with Lane on the hill. Wish us luck! The Swarm opened bracket play today with a convincing 20-3 win over the Brighton Bulldogs. The Swarm offense came alive with 11 first inning runs and never looked back, racking up 16 hits in three innings. 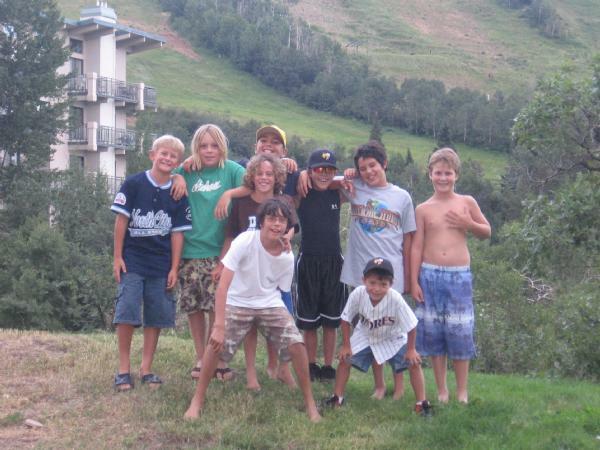 Lane O'Dea, Rob Simsiman, Dylan Robertson, Matt Myron, Tyler Delatorre and Tristan Sizik all had multiple hit games. The big story has been pitching and today's star was Tyler Delatorre. Tyler pitched a complete game, striking out six and walking three and giving up only four hits for his first Swarm win. With the win, the Swarm advances to their second round game today at 4 PM against the winner of the Parker Bandits/Colorado Bulldogs game. Jaylon King will start for the Swarm. The San Diego Swarm finished their pool play with a doubleheader split, going 2-1 and most likely landing a spot in the top 16. The first game featured another masterful pitching performance, this time by Rob Simsiman. Rob pitched 5 2/3 innings, giving up only 2 earned runs and three hits, striking out 5 and walking only 2. At one point, Rob retired 13 in a row, and 14 out of 15 (he picked off the only runner to reach base). Jordan Pearce came on to strike out the only batter he faced in the 6th to get the save. Tyler Delatorre caught another great game behind the plate for Rob and Jordan. Offensively, Lane O'Dea, Rob, Jordan and Jaylon King had two hits each. (Rob has yet to be retired at the plate in three games, with 3 hits and five walks in eight plate appearances). The second game loss was played immediately following the first game in blistering heat. The boys battled but came up short. Tristan Sizik pitched 2 2/3 innings, striking out 1 and walking only one. The seedings for the finals come out tonight at 7 PM, and we will post our schedule when we know the bracketing outcome. The boys are playing excellent baseball against some of the top teams in the country, and we are having the best time. See all of our pictures in Photo Albums. 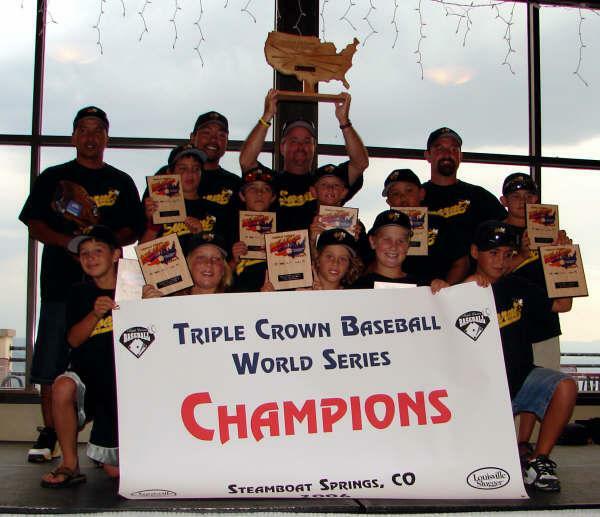 The San Diego Swarm opened their pool play in the 2006 Triple Crown World Series with a 7-4 win over the South Metro Kodiaks (Colorado) today at Oak Creek. Dylan Robertson got the win, pitching a complete game. He gave up 3 hits and struck out 3 in the five inning effort. The defense sparkled behind Dylan. Rob Simsiman made three nice plays at 3rd, Jordan Pearce started a key doubleplay in the 3rd inning, Yassin Wahhab made all three plays at 2nd including the doubleplay with Jordan, Thomas Zlatic made 2 sliding catches in right, and Lane O'Dea threw a strike from centerfield that very nearly completed a spectacular doubleplay with Tyler Delatorre, who caught a great five innings for Dylan. Matt Myron hit a bullet to right and made a nice catch in left. On offense, Thomas and Jordan led the way with two hits each. Jaylon King and Tristan Sizik provided the extra base hits, Jaylon with a triple and Tristan Sizik a double. Seven of the 10 batters got hits. Tomorrow concludes pool play with a doubleheader in Hayden, CO. The first game is at 8AM against the Bear Creek Bears, and 10AM vs. the Santa Clarita Redhawks. Rob Simsiman will start game one. The entire team and their families have had a great time trading pins with all the teams. We are having a great time. We are reading all of the guestbook postings and really appreciate the support from home!! GO SWARM! All ten Swarm players participated today in opening ceremonies and the skills competition leading up to tomorrow's tournament opener, and five walked away champions! Lane O'Dea, Tyler Delatorre, Dylan Robertson, Yassin Wahhab and Rob Simsiman beat all comers and finished first in the around the horn competition today. The fab five put up a time of 6.22 seconds. GREAT JOB BOYS! In the home run hitting contest, Jordan Pearce and Thomas Zlatic each hit 2 homers, and in the throwing accuracy competition, both Matt Myron and Tristan Sizik hit the target at home plate and scored in the top half of their group. After the competition we went back to the pool for a swim and are looking forward to Gino and Rafael's cooking later tonight. We open up the tournament with a game tomorrow at 4:30 PM with Dylan on the hill to start. 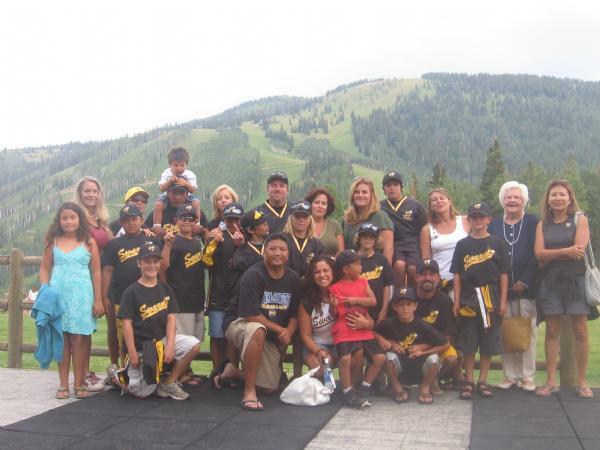 The San Diego Swarm arrived in Steamboat Springs, CO for the Triple Crown World Series today. The weary travelers took planes, trains (or trams) and automobiles to the beautiful Yampa Valley at the base of the Steamboat Springs Resort. Tournament preparation will begin with river rafting down the Colorado River on Monday . . . after some well deserved rest. Check The Swarms' travels on the website and photos under Photo Albums. Swarm Players Star in Fallbrook Tournament!! 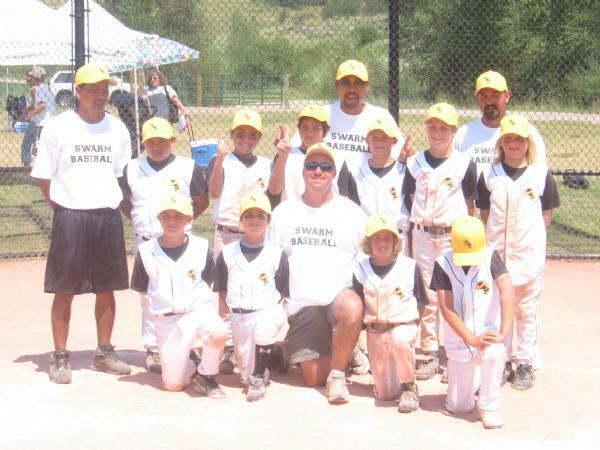 Nine Swarm players competed for North City in the Fallbrook Memorial Tournament this weekend. Congratulations to Yassin Wahhab and Morgan Roman Baumeister for each hitting a homer and playing great defense as their Pinto team won their championship. In the Mustang division, Jordan Pearce homered and pitched brilliantly and Lane O'Dea played a great centerfield and had multiple extra base hits as the Mustang Red team finished 2nd in the 10 team field. Jaylon King homered for the Mustang Blue team and along with Thomas Zlatic, Rob Simsiman, Dylan Robertson and Tyler Delatorre banged out multiple hits and played great defense. With all this talent, the Swarm can't wait to get back on the field together. Great job boys! !